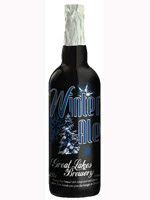 Great Lakes Brewery is set to release it's Winter Ale. Currently they are warming up down at the brewery for this release which is currently aging in the tanks. Bottles will start hitting shelves mid month. "Inspired by the long, cold and seemingly endless Canadian winter, our 6.2% alcohol Winter Ale is a true winter warmer. Handcrafted with specialty hops and malts, combined with generous amounts of cinnamon, honey, ginger and orange peel, this unique beer is brimming with flavour. Available only for a limited time." Look for this at the brewery or the LCBO.